ABOVE: The Prinzipalmarkt in Münster's Old Town during Advent. Münster is one of Germany's most appealing smaller cities, with a 1,200-year history, a town center that blends the medieval with modern, and the lively atmosphere that comes from having a university with 39,000 students. 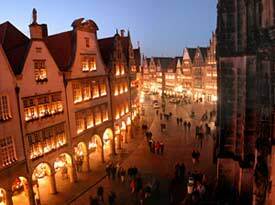 Münster is popular with Dutch and German tourists, but most English-speaking travelers have barely heard of the city. More curious yet, Münster is ignored by guidebook publishers such as Frommer's and Fodor's--despite the fact that Münster is only one of 13 cities that have been admitted to Historic Highlights of Germany, a consortium of cities chosen for their "special charm, architectural brilliance and historic character." Still, mass-market tourism's loss is your gain: You won't trip over fellow Americans or British tourists when you enjoy the pleasures of this attractive city near the borders of the Netherlands and the German Rhineland. And enjoy it you will--ideally, for at least a few days, or even a week if you can spare the time to browse through museums and explore the surrounding countryside of Münsterland.